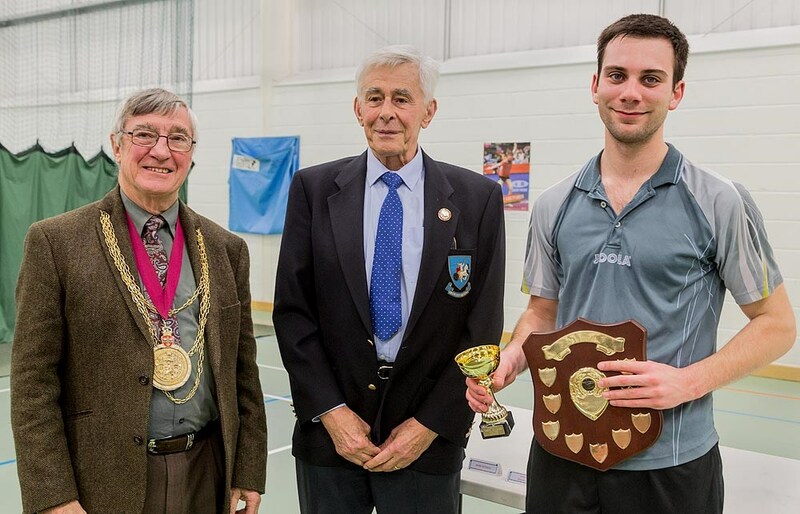 On a weekend full of joy, disappointment, tears and laughter, no one was more elated than Jake Collins as he successfully defended his title to become Colchester Men’s Singles champion for the second consecutive year. Ranked 119 in England, Collins had to work hard to reach the final, which was the last match to be played on “Final’s Night”. Collins, of Gt Horkesley, received a bye in the first round, meaning this set up a last-16 tie with Wudong Liu. Liu almost caused the biggest shock of the weekend after going 2-0 up, but Collins fought back strongly to win the match 3-2. Next up was Gary Young who had the potential to knock him out, but Collins held firm to reach the semi-final. 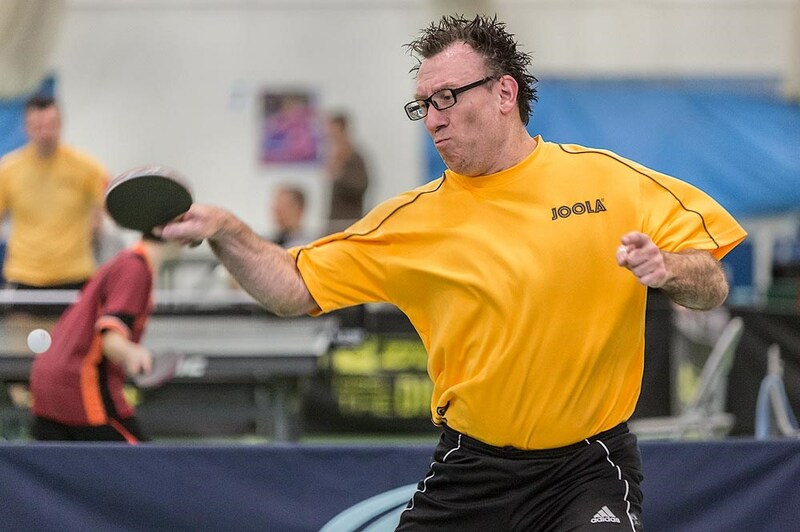 This was Collins’ biggest test yet as he had to overcome recently crowned Braintree Men’s Singles champion, Steve Kerns. Kerns made life difficult for Collins, taking him to a deciding set. Despite Kerns valiant effort, Collins reached the final winning 11-8 in the 5th. 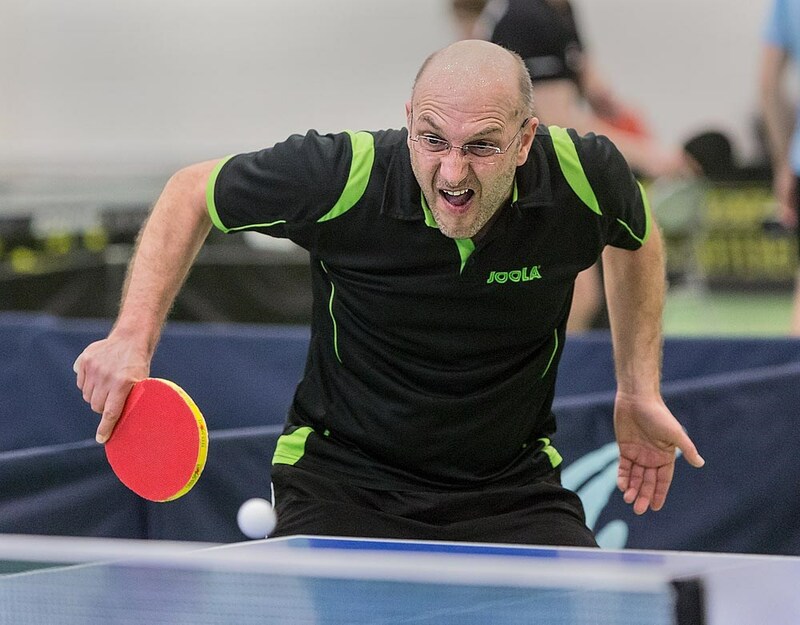 Collins’ opponent in the final was to be Rik James (Rowhedge), who last won the men’s title in 2005 and was making his first comeback since that victory. James had an easier route through to the final, but a semi-final battle with Andy Warner (2012 champion) was destined to be a good one. The match did not disappoint and with James mainly playing several feet away from the table in a defensive stance, this enabled “Wobbly Warner” to inflict some powerful shots. However, he must have been surprised when James returned almost every shot that was coming his way. With James mixing his defensive play with some aggressive shots, this helped him move into a 2-0 lead. Warner then started to play more defensively but this could not bring him back into the game, losing 9-11 in the 3rd set. The final of the Men’s Singles was the match everyone had been waiting for. Collins and James had only met once before, with Collins defeating James in 5 sets. James played similarly to how he did in the semi-final, and this seemed to work as he won the 1st set 11-7. In the 2nd set, Collins played a lot more close to the table and made James work for his points. Collins reversed the previous set’s score-line and won it 11-7. Having found it to be successful, he carried these tactics forward into the next set and won the 3rd 11-6. Tension grew in the 4th set and tiredness was starting to kick in. James improved his game from the previous couple of sets, however he found himself 7-10 down to give Collins 3 championship points. 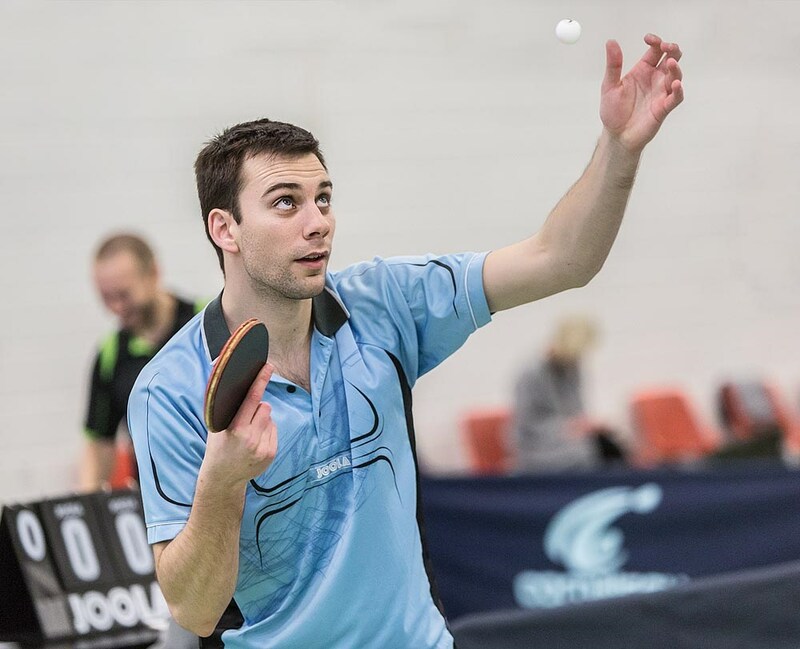 Collins only needed the first one with a crosscourt forehand winner to win 11-7 and become Colchester Men’s Singles champion for the second year running. The match was high-class from start to finish and was one of the best contests the tournament has seen for many years. In the Ladies’ Singles final, another player was hoping to retain her title she had won in the previous year. 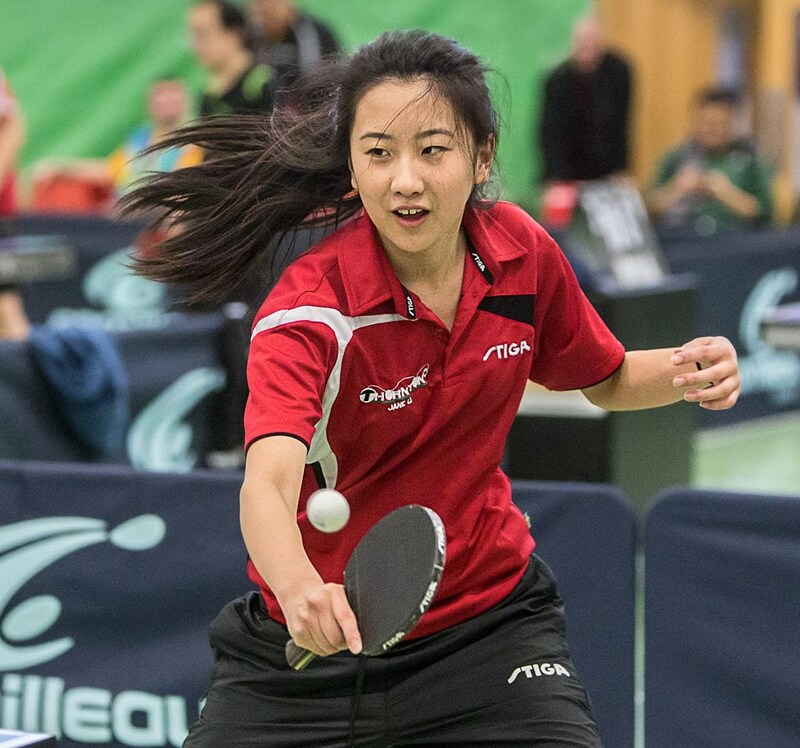 Jane Li, who is ranked 22 in England (Junior Girls), had to defeat Annabelle Rodriguez (Tollgate) if she wanted to hold on to the prestigious title. Li (Tollgate) got off to a good start winning the 1st set 11-6. In the 2nd, Li played several superb passing shots to ease past Rodriguez 11-4. Rodriguez found some form in the 3rd set, but Li was just too strong for her and won it 11-9 to become Ladies’ Singles champion for the second year running. The Junior Boy’s Singles final was contested between two players who have not featured on Final’s Night before. Sam Hume of St James and Lewis Bardell of Rowhedge had never played in such an important game with so much on offer, so feeling relaxed would be a key to success in this match. It was Hume who got off to the better start, taking the 1st set 11-5. Hume grew in stature in the following set, and experience playing in past tournaments showed as he thrashed Bardell 11-2 in the 2nd. 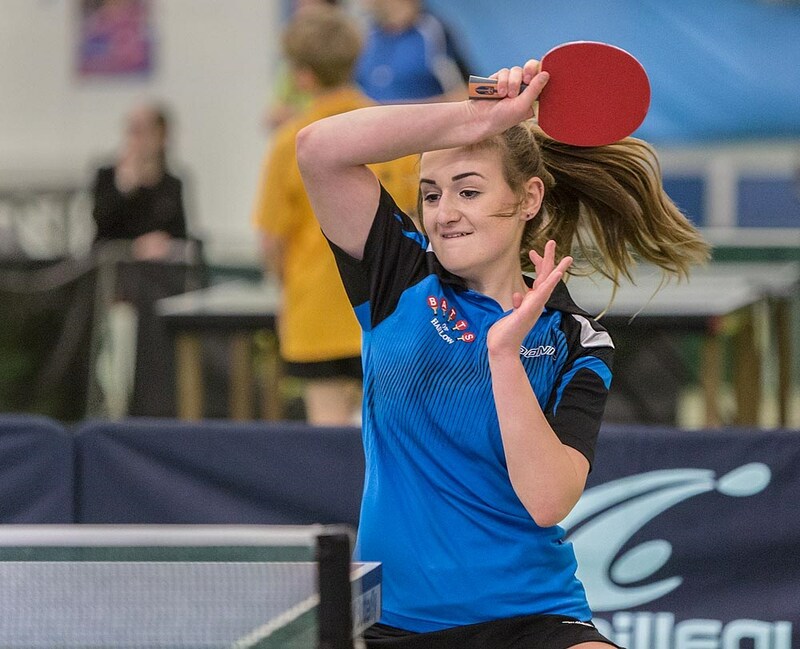 Tension was an obvious barrier for Bardell, who needed to quickly find some confidence in front of a crowd of more than 30 spectators, including the Mayor and Mayoress of Colchester. Fortunately, he found some inner strength and some of the shots he used to reach the final in the first place. Bardell equaled the set to make it 10-10 and saved a match point. However, Hume found a way past him and won the set and match 13-11 in the 3rd. Rik James’ other final of the evening was in the Veterans 40+ against Colin Stallwood (Tollgate). James was complaining about muscle pain early on in the match having only just played his men’s semi-final. He put this to the back of his mind and managed to win the 1st 11-8. Stallwood started to play wider shots and he found these to be effective, even against the ever-returning shots of James. However a couple of unforced errors proved to be costly as Stallwood lost the 2nd set 13-15. James found another gear in the 3rd set and sealed the title 11-5. 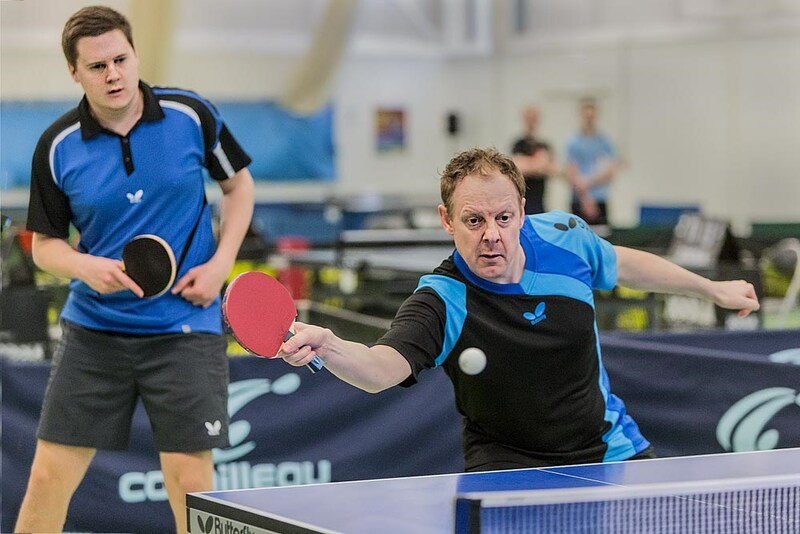 After being knocked out of the Men’s Singles, Andy Warner wanted to come away from the night with at least one title on the night, so had to rely on the help of Nigel Hodder (Tollgate) in the Men’s Doubles to do so. Stopping them from winning were Jake Collins and Richard Hutchinson (Gt Horkesley). Collins and Hutchinson took the lead initially winning 11-7 in the 1st set. In the next set, Warner and Hodder raced into an early 9-3 lead, only to be pegged back to 10-7. This was not enough for Collins and Hutchinson, however, as they lost the next point for the match to be equaled at 1 set apiece. The 3rd was a much closer affair and it went to Warner and Hodder 13-11. Collins and Hutchinson, knowing they had to win the next set to stay in the match, found something extra with some good rallies to win the 4th 11-8. In the deciding set, Warner and Hodder were determined to leave the evening with a title, and this helped to spur them on to win the 5th 11-5. With three juniors taking part in the Ladies’ Doubles final, this was a first for the Colchester tournament. 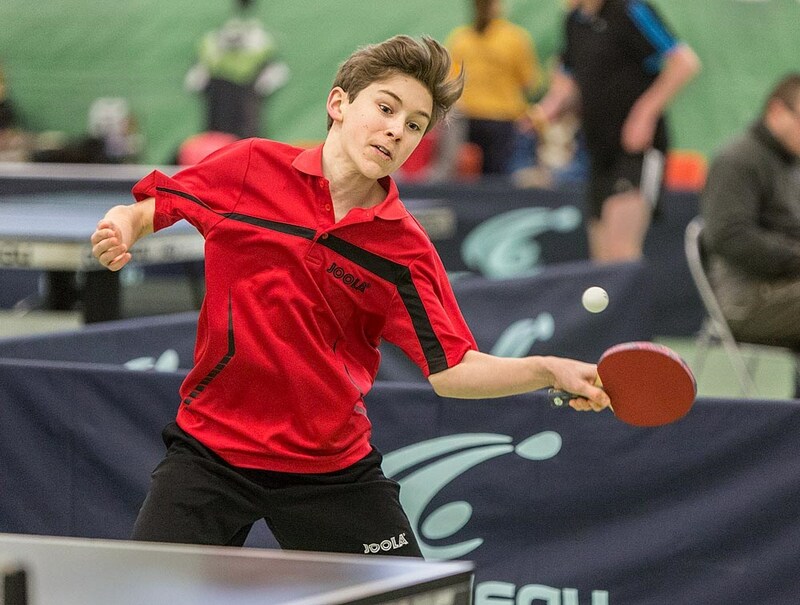 It shows how well juniors are progressing in the Colchester area and can only improve their confidence knowing there will be many finals ahead of them. Jane Li and Gracie Edwards teamed up to face Lauren James (Rowhedge) and Annabelle Rodriguez. Li and Edwards won the 1st set 11-7 with both teams settling down quickly and playing some nice shots. Even though James (daughter of Rik) and Rodriguez improved in confidence, they went down 9-11 in the 2nd set. Being 2-0 up, this enabled Li and Edwards to play riskier shots. This had a positive effect on their gameplay and they went on to win 11-3 in the 3rd to take the title of Ladies’ Doubles champions. The Mixed Doubles final was between four players who had already played in a final earlier in the evening. Gracie Edwards partnered Andy Warner, whilst Annabelle Rodriguez was playing alongside Colin Stallwood. The 1st set went to Rodriguez and Stallwood 11-4. Warner injected some vital encouragement into Edwards in the next set, which helped them win it 11-7 and equal the match 1-1. An even closer set was to follow, with Rodriguez and Stallwood winning it 11-9. Only one more set out of the two was needed for the title and they took it in the 4th, comfortably winning 11-5 to become Mixed Doubles champions. Charlie Fulcher beat Ian Whiteside in the final of the Veterans 50+ final. With Fulcher not eligible for the 60+ competition, Whiteside made up for his earlier loss by winning this title. The Junior Girls Singles was contested as a round robin group as only four girls entered. There was no surprise when Li (Ladies’ champion) was crowned Junior Girl’s champion to add to her collection of trophies won over the past few years. Hume won the Cadet Singles to add to his Junior Boy’s title. With Hume being so young, he still has many years ahead of him to improve further, so will definitely be a contender for the Men’s Singles title in a few years’ time. Li and Hume formed a partnership in the Junior Doubles, in which they comfortably won. Hume, already having won his fair share of trophies, did not want to stop there. He won the Division One title against John Hatley, both of whom play for the same team (St James C). Roger Warren won the Division Two title and Mark Glenister won the Division Four title. As not enough entries were made in the Division Three competition, this event was not played.